ok, i suppose it isn’t officially summer for a few more days, but the last few weeks have certainly felt like it to me! the weather is warm, all of the school kids are out for the summer and roaming the streets, and my favorite swimming spots are filled with families soaking up the sun. i’ve been making my best effort to take it easy on the weekends, avoiding work like the plague and spending as many hours as possible lounging around outdoors with some sort of summery cocktail in hand. most weekends have been pretty casual when it comes to outfits, but yesterday i decided to step up my summer game just a little bit in my new carven pinafore. i’d been drooling over this acid yellow dress for over a year, hoping that by some strange series of events, it would somehow be mine. dreaming about owning this little gem actually led me to make a concerted effort to lay off the spending and to save up a little for more special pieces. having said that, i still waited for it to go on super sale at net-a-porter before taking the plunge. me and this dress, we’re gonna have some fun times this summer, haha. Ooh-la-la! Whatever you spent on that dress, it was worth it! (Although I can’t deny that I am a little jealous)! Fantastic color combination! Love it! I don’t think I’ll ever tire on how you consistently style classic pieces and make them look fresh. Great pinafore and great pairing with the Ferragamos and the striped shirts. Endless Summer indeed. you look amazing. that pinafore is gorgeous! You look lovely! 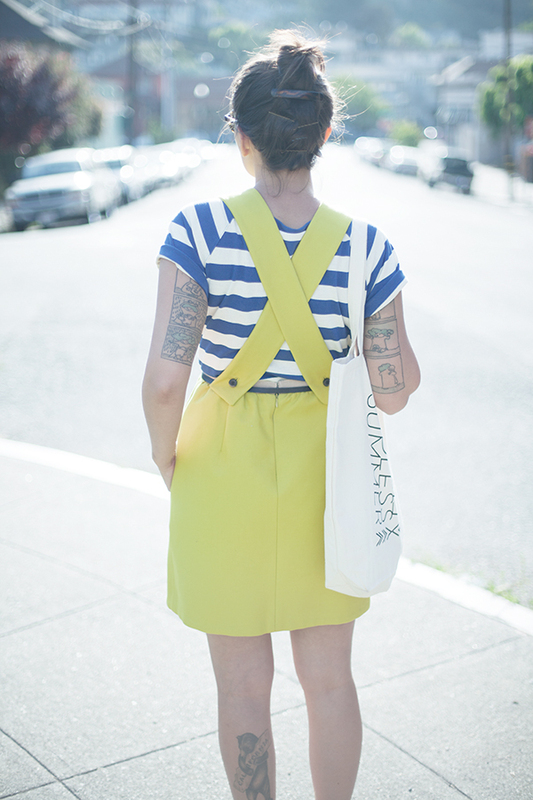 I would never think to pair navy and yellow together, and yet it totally works. Loving the top-knot too. I just posted my Birthday outfit over on my blog, take a look if you can! I absolutely love the yellow against the blue and white stripes. So striking! That dress is a stunner. Carven can do no wrong! Your styling of it is really great, I never would have pictured it with bright blue stripes. Lovin it. Oh my goodness. These colors are so perfect together. You made the right choice to save up! Fabulous! The skinny black belt adds the perfect touch! I am so obsessed with the back! This is so pretty! I love that dress, it’s really original!! You’re so innovative and inspirational, plus you look gorgeous! So lovely, perfect contrast dress! What an amazing summer dress! Enjoy summer! oh that dress is so adorable! you look lovely with these dress and top…love the color combo! That dress is amazing, and looks adorable with the blue and white stripes. I love how casual and nonchalant you look in your jump photos–I never even know you’re jumping until I scroll down to the see the rest of the photo, and the whole effect makes you look like you’re just hovering. aww super cute summer outfit! Am LOVING this pinafore, so much so that I posted in on Style Saint!! Check it out and start tearing! I cannot believe how cute this outfit is ! 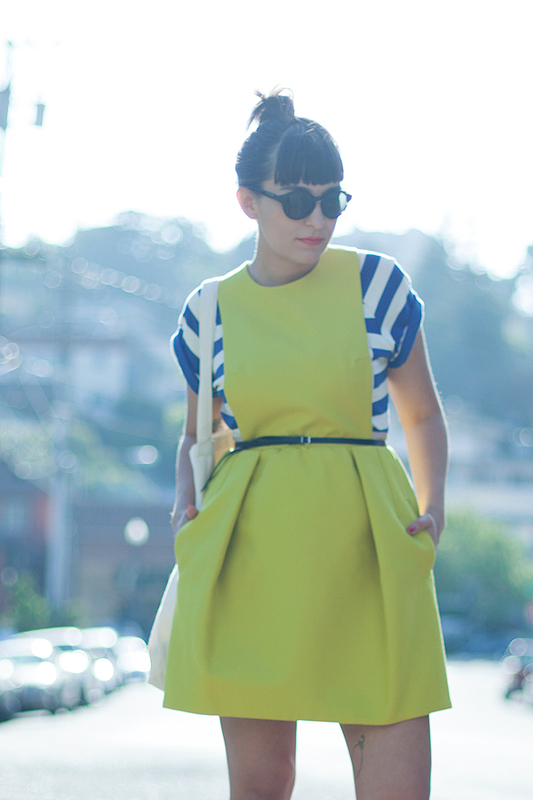 I’m so in love with your yellow pinafore dress. The striped top looks awesome with it and I love your flats. You look amazing! 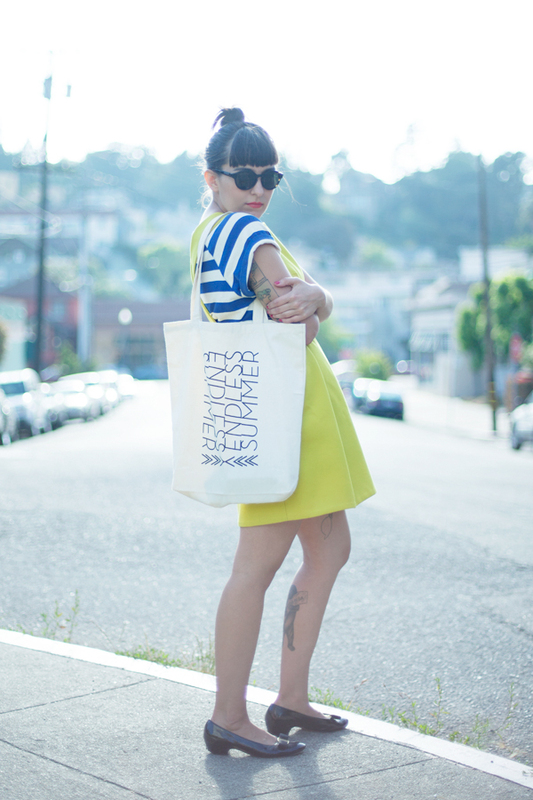 Just wrote about you as one of my favorite SF/Bay Area style blogs! Of course linked to this post since its one of my favorite looks. Love the blog! hi mollly! thank you so much for including me! i loved reading your post!